Homeowners in Aberdeen, Maryland are constantly looking for ways to boost both home value and curb appeal…which will further help boost home value. It’s a self-perpetuating circle of home value. But in order to reap the rewards, you need to know where to start. We suggest a Nicolock paver patio. What are the Benefits of Nicolock Pavers? Nicolock is a 100% U.S. owned and operated company specializing in the production of patio pavers and other hardscaping products. Nicolock manufactures a complete line of interlocking concrete paving stones, architectural paving slabs, precast concrete products, and segmental retaining wall systems. Affordable: Nicolock paving slabs are beautiful and very cost-effective options. They are an affordable way to increase the aesthetic value and functionality of your home. Curb Appeal: Nicolock paver patios are incredibly attractive and Nicolock’s patented manufacturing technology – Paver-Shield™ – ensures that your pavers will look great for a long, long time. Home Value: With an average return on investment (ROI) over 80%, according to Remodeling Magazine’s annual Cost vs. Value report, a new patio is an excellent way to boost your home value. 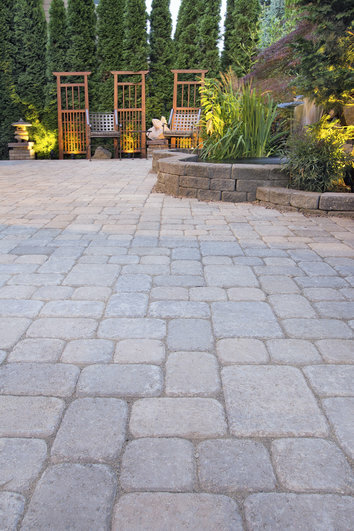 Durability: Because the rich, vibrant color is throughout the full thickness of the paver, it will not fade over time. Green: Nicolock manufactures several variations of eco-friendly permeable paving products. And because every Nicolock hardscape product is made from natural materials, they can be recycled. Warranty: All Nicolock products come with a limited lifetime warranty. Interested in learning more about Nicolock pavers? Or maybe you are ready to move forward with your new patio. Either way, Nicolock has hundreds of wholesale distributors and contractors along the east coast. With 40 years in the home improvement industry, Freedom Fence and Home has earned a reputation for high quality work and even higher quality customer service at an affordable rate. Our hardscape experts are ready to help homeowners and business owners in Abingdon design a new patio that will have passersby noticing your home or business. Click Here to view our patio gallery. This entry was posted on Wednesday, June 3rd, 2015	at 1:43 pm	. Both comments and pings are currently closed.